A couple of years ago, I read a book called 1421 : The Year China Discovered America. It's a fascinating book that demonstrates that just because we thought something was true doesn't mean it really is. While not entirely convinced of Gavin Menzies hypothesis, I can't discount it, either. Modern history still can't explain the Australian Aborigines, who, with the exception of one tribe, have no aquatic tradition, but did not evolve on the continent. (I discount the "God Done It" hypothesis.) Nor can they explain the epic journeys of the Polynesians, who spread all across the Pacific, populating the islands as they went along. 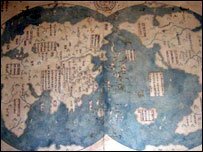 Last week, the BBC ran a story about a recently discovered map, supposedly an 18th century copy of a 15th century original, that suggests the theory might just be right. I'm not going to jump to any conclusions here, but should the examination of the map confirm its age, we might just have a whole new set of questions to ask. And the most important one is, what happens when a nation stops supporting science? The Chinese emperor decreed that there was nothing to learn outside of China. The records of their explorations were destroyed. Today, our government, dominated as it is by the Religious Right, is seeking to discount every single scientific discovery and replace it with either a "God Done It" or "Good for business" spin.